Although she has only moved a few miles down the road, Hayat Qarnous wakes up to a world vastly different from the one she knew just a few weeks ago. Back then, she was living in Rableh, a village on the Syrian side of the Syria-Lebanon border and once the center of a quiet farming community. But since the Syrian uprising started in March 2011, it has been anything but peaceful. It is this lack of peace, and its consequences, that have pushed more than a million Syrians to flee their homeland since the beginning of the conflict. About 320,000 Syrians have fled to neighboring Lebanon and registered with United Nations aid agencies there. But many observers believe equal numbers of Syrians have not registered with the authorities in Lebanon; among these are an estimated 10,000 Christians. 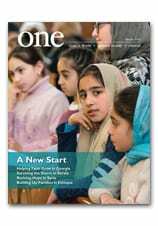 Read more about Crossing the Border in the Spring 2013 issue of ONE. During our Holy Land pilgrimage a few weeks ago, we had the privilege of visiting Jerusalem’s Via Dolorosa, or “Way of Sorrows.” While the route has varied over the centuries, tradition holds that this is essentially the path Jesus travelled on his journey to Calvary. To walk in the last footsteps of Christ while we remembered his suffering and prayed the Stations of the Cross was both memorable and moving. You can follow along as we trace Christ’s path in the video above. The heightening tensions over a possible U.S. military attack on Syria were part of the discussion today in a meeting between Pope Francis and the king of Jordan. Dialogue and negotiations are “the only option for putting an end to the conflict and violence” in Syria, said Pope Francis and Jordan’s King Abdullah II. As Western leaders expressed strong convictions that the Syrian government carried out a chemical weapons attack against its own citizens and vowed to take action, Pope Francis met at the Vatican 29 August with King Abdullah and Queen Rania. Jordan borders Syria and hosts hundreds of thousands of Syrian refugees who have fled the fighting that began in March 2011 in an attempt to oust President Bashar Assad. The king and queen’s meeting with Pope Francis, who technically was still on vacation, was arranged hastily after tensions grew in the Middle East over the reported atrocities in Syria and the unrest in Egypt. Pope Francis, with an interpreter, spent 20 minutes speaking alone with King Abdullah and Queen Rania before meeting the seven members of the Jordanian delegation. The king and three aides then held a working meeting with Cardinal Tarcisio Bertone, Vatican secretary of state, and Archbishop Dominique Mamberti, secretary for relations with states. The Vatican statement said that during the meetings with the pope and with officials of the Vatican Secretariat of State, the two sides also discussed the problem of stability throughout the Middle East, Israeli-Palestinian relations and the question of the status of Jerusalem, a city sacred to Christians, Muslims and Jews. The Vatican, the statement said, also expressed appreciation for the king’s commitment to promoting interreligious dialogue and his decision to convoke a conference in September about the challenges facing Christians in the Middle East. Although the statement indicated a broad range of topics were touched upon, the meeting drew international attention because of the situation in Syria. Read more at the CNS link. Pope Francis greets the king of Jordan and his wife this morning at the Vatican. This morning I offered Holy Mass in our New York office. I was joined in the celebration by my colleagues — and in spirit by our entire CNEWA family. Our purpose was to lift up the special intentions of our many generous benefactors. I am deeply grateful to all of you who shared your prayer requests with me. Some of you asked me to pray for the soul of deceased loved ones, others for relief from an illness and still others for children who have fallen away from the church. Whatever you asked me to pray for, I carried your intention with me to altar and offered it up to the Lord. My friends, I am thrilled to do this for you, because it is your generosity and your solidarity with the poor that makes it possible for CNEWA to fulfill the mission entrusted to us by our Holy Father. It is a privilege to be able to join my prayers with yours during Mass, and I plan to continue doing this for your special intentions in the future. In the meantime, you are never far from my heart. Thank you for your continued generosity, your faith, and your prayerful support! Yesterday, Currents, a program on the Diocese of Brooklyn’s NET television station, aired an interview with a familiar face — CNEWA’s own Rev. Elias Mallon. As the Mideast cauldron boils, a top church leader is cautioning that Christians always pay the highest price — scapegoats whenever trouble occurs in the area. But Maronite Patriarch Bechara Peter also claims that outside countries — especially in the West — are deliberately fomenting conflicts in the region with one goal in mind — destroying the Arab World. To gain further insight into the patriarch’s observations, our Bill Delano went to the headquarters of Catholic Near East Welfare Association, a direct Papal lifeline to the churches in the Middle East. Bill spoke with the association’s external affairs officer, Father Elias Mallon, who is also the chairman of Catholic-Muslim Dialogue for the Archdiocese of New York. Bill asked Father Mallon about what the Maronite leader said and about conditions on the ground right now. The Coptic Orthodox Church of the Virgin Mary sits in a tiled courtyard a few miles outside Cairo, on the left bank of the Nile as the river bends south toward Upper Egypt. The structure’s front doors overlook the famed river, which Egyptian Christians who pray and worship here are convinced transported Mary, Joseph and their small boy, Jesus, to safety from persecution back home. “In those times, this was a dock area from where the boats took off for Upper Egypt. The Holy Family came here from Palestine and got on one,” explained one of the church’s five priests, from an office overlooking the water. Like the priest, many Copts — the name for Egypt’s indigenous Christians — trace their religion all the way back to Jesus who, according to the Gospel of St. Matthew, sought refuge in their country from the wrath of Herod the Great 2,000 years ago. Coptic tradition holds that Christ stayed in Egypt for three years and that later, around the year 42, St. Mark the Evangelist also came to evangelize in the Egyptian port city of Alexandria, before being martyred there. Christianity continued to spread among the locals called “Copts,” a derivative from the Greek word for Egypt, and by the third century, Christianity was the country’s dominant religion. By the time the newer religion of Islam arrived in Egypt in the middle of the seventh century, Egyptian Christianity had already provided the church with some of the world’s major Christian saints and had introduced new forms of monastic life. Tension between Egypt’s Copts and Muslims has long been a problem, but recently it has dangerously spiked, first since President Hosni Mubarak’s overthrow by popular revolt in 2011, and even more so since the military’s July 3 ouster of Islamist President Mohammed Morsi. Morsi was aligned with the Muslim Brotherhood, whose members the Egyptian military is now pursuing. Violence has surged even further since 14 August, when security forces raided two pro-Morsi protest camps in Cairo, which killed hundreds of people, most of them protestors. Church leaders and independent human rights groups have recorded attacks on dozens of churches, schools, buildings, homes and other institutions belonging to Christians. Some non-Christian institutions have also come under attack in the violence, including government and security offices. And visit this page to learn how you can help CNEWA to help Egypt’s Christians.